The history of Tarot cards has been filled with mystery. Stories of Egyptians, Gypsies and Atlantis have figured prominently. But most such tales are nothing more than fiction. In fact, the Visconti-Sforza deck is the oldest known Tarot deck to exist, and it’s from 15th Century Italy. There’s nothing Atlantian, Egyptian or Gypsy about it. And from all accounts, it was originally used for nothing more spiritual than a good game of cards. How then has the Tarot deck come to be such a staple of the occult? When did it change from being used for games like Tarocchi, to being considered a doorway to the spirit world, or even a window into our unconscious? These are good questions. And they’re all answered in the very comprehensive, A History of the Occult Tarot: 1870-1970 by Ronald Decker and Michael Dummett. Everything is in this book. Incredibly thorough descriptions of different decks, western occult theory, and the histories of many magical societies and their colourful members. Organizations like The Brotherhood of Luxor, The Theosophical Society, The Golden Dawn and the Holy Order of MANS. People like Etteilla, Èliphas Levi, Aleister Crowley, Arthur Waite, Ouspensky and Eden Gray. These are just a few names from a long and convoluted history full of revelations, betrayals, chicanery and some serious pursuit of spiritual awakening. It’s an incredible story. And perhaps a little surprising for anyone under the impression that seeking spiritual enlightenment is the same thing as finding it. This book was first published in 2002 and doesn’t look at many decks past 1970, but it’s fabulous. If you’re interested in knowing how today’s Tarot came to be, check it out. 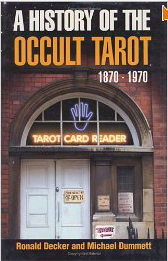 You are currently reading A History of the Occult Tarot: 1870-1970 at The Tarot Room.